With a forecast for cloudy and cool conditions for race morning, I was feeling confident that I would at least have an opportunity to run well but I was a little surprised when we walked out of the hotel and it was raining. We were hoping it would just be a passing shower and perhaps by start time it would have passed on. Since the half was starting at a different location we said good-bye to Frank and headed over to the Lehigh Valley hospital for the start. The rain continued while we waited so we stood under my umbrella until about 10 minutes before the start and then took off our extra layers to put in a drop bag to be taken too the finish. It was 60F so we knew we would be plenty warm once we began running. Bart Yasso was the Race director and sent us off promptly at 7am. I planned to take it easy the first mile and then settle into my goal pace of 8:25 miles but the course turned out of the parking lot and immediately started down a steep hill for about 1/2 mile where we turned onto a flat crushed gravel bridle path. Even though I was making an effort to hold back I went through the 1st mile in 8:04. This section was along a pretty creek and close to 2 miles we ran underneath a large covered bridge. I relaxed a little too much and passed mile 2 in 8:51 so I picked the effort up once again but was too fast in 8:03. About here the course went up a short hill and we got back onto roads through Allentown. I finally hit a split close to what I was hoping for in 8:27 for mile 4 and then I seemed to finally settle into a steady rhythm with mile 5 in 8:24. Perfect. As I approached mile 6 which I once again ran too fast in 8:09 it seemed that the rain was slacking off but after crossing over the Lehigh River Bridge and onto the canal towpath it began to rain heavier. The canal towpath was getting muddy by now and we also had to be careful of rocks and roots. I still enjoyed this section quite a bit as it was very pretty and interesting in places. We had the canal on the left with a train yard beside it for about the next two miles and the river on our right. I was back on pace at mile 7 in 8:24 and then mile 8 in 8:33. Passed mile 9 in 8:39 and mile 10 in 8:21. At this point my overall time was 1:24:01 so I was right on pace with a 9 second cushion and feeling good. By now the path was a mess and there was not much point trying to avoid the puddles and muddy parts. At least the mud was not the sticky slippery kind so it didn't seem to affect my stride and I was able to run normally and passed mile 11 a little too quickly in 8:10 just as we came off the towpath and headed up into downtown Bethlehem. It was nice to get back onto pavement for awhile and the next thing we did was an out and back spur through a park. This was nice and I was wondering if I might get a glimpse of Karla but I was already to far ahead. The course then crossed a bridge and into the downtown area. I missed the 12 mile in the confusion of the relay exchange. I took a gel and then as the course began a long gradual climb I just relaxed not worrying about the pace thinking I could make it up on the way back down. My time for mile 12 and 13 was a little slow in 17:19 but overall my time for the half was only about 15 seconds over pace. As I headed back down to the canal we passed a beautiful 2 story brick train depot. Mile 15 was 8:33 and then 16 in 8:37 but now I was not able to pick the pace back up. I was still feeling ok but I knew that a 3:40 was not going to be but if I just kept the effort going and didn't bonk I still had a good shot at my 2nd fastest time ever and that was my real goal. By now the rain had finally stopped but at least it was still cloudy. I still preferred the rain to warm and sunny. Mile 17 was 8:44 but I didn't let that discourage me. I was actually getting my 3rd wind and was able to pick the cadence up again and was right back on pace with mile 18 in 8:26. Mile 19 was 8:34 so I didn't lose any more time on my new goal of sub 3:45. I was turning inward now and focusing on maintaining an even effort. Just before mile 20 we turned away from the river and up a small but steep hill and I was a bit disappointed how hard it seemed and I felt I slowed down way too much. As I reached the top of the hill we were now on a gravel road with big chunks of gravel and I passed mile 20 in 8:52. That actually made me happy because I expected it to be slower. I was glad to final get off the gravel and back onto pavement as the coursed passed through the parking area for a boat landing. There was an aid station here and I took another gel and then passed mile 21 in 8:59. I picked up the cadence once again and the body responded giving me the confidence that I would be able to run this one to the finish. I was also steadily passing runners which is always a boost and although my pace was slower I was still running strong and counting down the miles. The course was now on a paved bike path still along the river as we headed into Easton. I passed mile 22 in 8:41 and then mile 23 in 8:43. Woohoo, only 5k to go and I'm running strong and holding a decent pace. but oh no, another little hill and it slowed me down way to much in 9:12 for mile 24. It made me mad because I really didn't want to go over 9 and I was losing my cushion on the 3:45. Just two more miles to go now so just dig deep and keep pushing. I was beginning to think I would never see the 25 mile mark and was worrying I had fallen off the pace again but I hit mile 25 in 8:58 and 3:34:05. About all my cushion was gone now and I was angry again because I didn't want to have to push the pace and hurt that last mile but I was determined so I kicked it up another notch. Once again the body responded but it was not easy I was moving past runners but moaning and groaning with every breath. I had my doubts and was nearly resigned to running just over my goal but I was determined to try. But before the finish we had to go up another hill as we left the bike path and back up to street level. I was gasping but still pushing and then we got a slight downhill to the 26 mile mark across a bridge which I passed in 8:34. Phew, I had done it. Almost 2.5 minutes to go 2 tenths but the finish was a cruel uphill to downtown Easton. I finally reached the end and high fived Bart Yasso as I crossed the line in 3:44:30. Another Boston qualifier and my 2nd fastest marathon. Frank , who had finished the half in 2:16 was waiting and got a picture. I got my medal and then walked around while waiting for The Marathon Princess. She was not able to get her pr and while I waited I was interviewed for the local news and shortly after Karla came into view. She looked good coming up the hill and I was glad that despite running slower than she hoped that she felt good and ran well. She also was 2nd in her age-group just beating out the 3rd lace lady by 8 seconds. Good thing she finished strong ! Overall I was very pleased with the marathon. It was fun with a nice course although the trail was a little rougher than I expected in places. The aid stations were frequent and well supplied and the volunteers were very supportive. If you are ever looking for a fun event in early September then give it a try. Here are some photos. 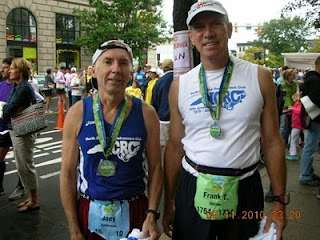 I didn't run with the camera but I took some along the course after the race and Frank got a few at the finish line.